Gay teachers less likely to challenge homophobia? Despite the ever-present challenges lesbian, gay, bisexual and transgender (LGBT) students face at school, a new study finds that gay teachers are actually less likely to challenge bullying in the classroom than their straight counterparts out of fear for their own jobs. As TES Magazine reports, the study comprised interviews with more than 350 teachers and school principals over how they deal with anti-gay incidents at school. The bulk of the interviewees who identified as LGBT said that not only did they not feel safe coming out at school, but they had rarely intervened when they witnessed homophobic remarks being made. Over one-third of the teachers interviewed for the survey said they were worried their jobs would be at risk if they came out to their colleagues, while 62 percent were worried about losing their jobs if they came out to their students, according to the report. As a gay teacher myself, I understand how other LGBT teachers might feel. Whereas, some teachers might not stand up to homophobic incidents, I do not allow any bullying or any disparaging remarks in my presence. I attempt to teach my students the golden rule. Though I might fear that it might out me to my students or that my students might perceive me as gay because of it, I don’t worry too much. Parents and students alike know that I am the one liberal teacher at the school, and so they think it is just one of my liberal diatribes when I challenge bullying in the classroom. I also tend to give them a mini sermon on the golden rule in the process. That being said, it does not mean that my job would not be in jeopardy if my sexuality did come out. I have allies on the school board, so I might not lose my job, but it is also quite likely that I would. We can hope that one day, the sexuality of teachers will not be an issue. Currently, it is a very real threat. News of the TES Magazine report follows the case of Carla Hale, a longtime teacher at Ohio’s Bishop Watterson High School who was reportedly fired after her partner’s name, Julie, was listed among the survivors in a public obituary for Hale’s mother. In February, Purcell Marian High School Assistant Principal Mike Moroski was fired by the Archdiocese of Cincinnati after endorsing gay marriage in a personal blog post, while in 2012, music teacher Al Fischer was dismissed from his job at St. Ann Catholic School in north St. Louis County, Mo., after archdiocese officials learned he was planning on marrying his longtime partner. Henry David Thoreau was born in Concord, Massachusetts, on July 12, 1817. He is perhaps best known for his works Walden, which touches upon the virtues of nature and simple living, and Civil Disobedience, which promotes peaceful resistance to acts by an unjust government. Thoreau died in 1862. Because you didn’t know she felt the same way about you… or if she did, for some reason it wasn’t okay… thought that people wouldn’t like it. And one day, after months, years, it’s just another day, nothing special, just the two of you. For some reason everyone’s out of the house. You can’t turn back, you can’t let go, you can’t stop – as if you were one person, defying gravity, together. I came across an article the other day about the MPAA creating a new website so that people can find legitimate and legal movies for download. I noticed that one of the websites was Wolfe Video. If you’ve ever watched a fair amount of gay cinema, you have no doubt come across Wolfe Video, the oldest and largest exclusive distributor of gay and lesbian films in North America. As I was looking through WolfeOnDemand, I came across one of my all time favorite LGBT movies, Defying Gravity . Defying Gravity was filmed in just 13 days using a cast largely of first-time actors, the film played the gay and lesbian film festival circuit in 1997 and 1998. It is an earnest, heart-felt movie. While its edges are rough, both in terms of the performances and the filmmaking, it’s these rough edges that actually make the movie feel more real in a way that polished Hollywood acting and production values would undermine. One could complain that it is yet another coming out story, and in many ways it is, but it’s an effective one. John ‘Griff’ Griffith (Daniel Chilson) is a college student who lives in a frat house with your typical college guys. Everyone is assumed to be straight, and the majority of brothers are. Griff wants to belong, but as a young gay man, he feels a certain amount of isolation. Because of his wanting to fit in, he remains in the closet despite the efforts of his boyfriend Pete (Don Handfield) to help him come to terms with his identity. Finally, a crisis forces Griff to take a stand for himself and for Pete. Yes, anyone who has seen more than a few gay-themed movies or TV shows will have seen this plot. But it is handled in such an honest and affecting way that you will forgive it. What sets this movie apart are the character relationships. Griff’s interesting relationships with best friend Todd (Niklaus Lange), with Todd’s girlfriend Heather (Leslie Tesh), with fellow student Denetra (Linna Carter), and with Pete’s father are what helps us to forgive the cliched elements of the plot. Of particular note are the relationships with Todd and with Pete’s father. Their reactions to Griff’s relationship with Pete are not what you have come to expect from coming out films. It makes for a refreshing change of pace, and writer/director John Keitel deserves credit for putting new spins on these stock characters. The acting never really rises above college drama student level, but that works for a movie about college students. Chilson, Lange, Tesh, and Carter all act earnestly and come across as believable college kids in ways that technically-trained performers might not. There is one particular scene when Griff goes to see Pete in the hospital. Griff utters one word, “Man….” He utters it in a long drawn out way, that melted my heart. Any flaws in the film were forgotten for me when I heard that line. I hope you will give this little movie a chance. Be patient, therefore, brothers, until the coming of the Lord. See how the farmer waits for the precious fruit of the earth, being patient about it, until it receives the early and the late rains. You also, be patient. Establish your hearts, for the coming of the Lord is at hand. Do not grumble against one another, brothers, so that you may not be judged; behold, the Judge is standing at the door. As an example of suffering and patience, brothers, take the prophets who spoke in the name of the Lord. Behold, we consider those blessed who remained steadfast. You have heard of the steadfastness of Job, and you have seen the purpose of the Lord, how the Lord is compassionate and merciful. So many of the situations that we find in life are endurable because we know what their end will be. We need to be patient, patient for the Lord. As a gay Christian this is not something that is going to be easy. We get persecuted for what we believe, some places we are ridiculed for our beliefs, and others, heterosexual Christians or LGBT non-believers reject us for our beliefs. But, we must stand firm! In the black nights of suffering, when ominous clouds come in from the west, it’s hard to know whether those clouds bring nourishing rain or devastating tornado that destroys a all in its path. We have no way of knowing how long we’ll be suffering from a disaster or how long our heart will ache. We need to love one another, stop talking negatively about one another. Watch our tongues because what we say usually is what is in our hearts. We shouldn’t be speaking with hate, condemnation, gossiping just to tear some one else down. We need to stand for the Lord, let others see Him in us! No matter what the consequences we need to be bringing others to Him and not making others start thinking that if that is what a ‘Christian’ is like then what’s the point? Just do our best to remember that we shouldn’t have to ‘swear’ about these things…simply say Yes or No. That we are followers of Jesus because He has died for our sins and if we believe and have repented for our sins He will give us eternal life! This is why we follow. No arguing with others about it, no ‘swearing’ about it. Just let it be…Yes or No. P.S. I apologize for the late post. It’s been an incredibly busy weekend, and I did not have computer access until just now. On July 25, 1985, HIV/AIDS was given a global spotlight when it was announced that screen icon Rock Hudson was suffering from the disease. Looking gaunt and almost unrecognizable, rumors began to circulate about his health earlier in the summer when the actor had made a public appearance to promote a new cable series of his friend and former co-star Doris Day. Hudson’s AIDS diagnosis put the disease into the headlines and changed the way the public thought of AIDS patients, as well as gay stereotypes. Before his death he created the Rock Hudson AIDS Foundation, donating the $250,000 he received from an advance of a biography to the foundation. My favorite author Greg Herren has a new set of mystery novellas that are quick reads and a hell of a lot of fun. I just finished reading the first one last night, and if from reading my reviews of his books, you’ve become a Herren fan as well, then how can you resist this e-book for just 99 cent? It’s worth every penny and then some. Paige Tourneur (Please! Is that really her name?) is the former Times-Picayune reporter and best friend of Herren’s gay detective Chanse McLeod series. To hear her buddy Chanse tell it, Paige is rotund, cute as a button, a truly bad driver, and the best friend a gay P.I. could possibly have. Now Paige gets a chance to tell it herself in her own witty and worldly-wise way. Seems like she has quite a past and in Fashion Victim , it’s starting to haunt her. Though it helps to be familiar with Paige from the Chance McLeod series, this novella works well as a stand alone mystery. It just adds a little bit of a thrill for the readers, if you already know Paige. Since his first novel, I’ve wanted Paige to be a more developed character. She’s still the same hard-drinking, hard-bitten, smart-mouthed red-headed reporter with the heart of gold and the unlikely name. I’ve also always wanted to know more about the his crime fighting NOPD duo Venus and Blaine, but we will have to wait and see if they get books of their own as well. They remain to be the characters that connect his Chanse McLeod and Scotty Bradley mysteries. Of course, the city of New Orleans connects them as well. And it would be a dream if Chance and Scotty would have a crossover mystery. In her first solo outing, Paige has long since left the Times-Picayune, played out a stint on television, and has now landed a job at Crescent City Magazine, which sends her out to do a personality piece on bitchy fashion designer Marigny Mercereau. Only Marigny ends up dead fifteen minutes before her fifteen minutes of fame. Twisting through Marigny’s creepy past, Paige is accompanied, as always, by best friend Chanse, her cop buddies Venus Casanova and Blaine Tujague, and (finally!) by the perfect man: her new boy friend, Blaine’s brother Ryan. So what happens when a woman meets the perfect man and her past comes calling? 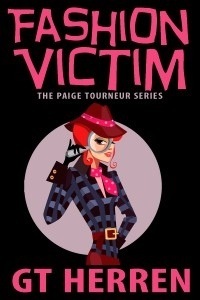 Fashion Victim is the first in a series of interconnected novellas in the “Paige Tourneur Missing Husband Series.” The second volume, Dead Housewives of New Orleans , is already out and is on my next to read list. A pair of teenagers from Oklahoma might seem like your typical young couple, but their love story is unlike many others. The transgender couple actually transitioned together. Just two years ago, Arin Andrews and Katie Hill hadn’t transitioned yet. The two had struggled with their identities throughout childhood; Hill had struggled with bullying. Then one day they met at a trans support group, after each had begun the transitioning process, and they fell in love. Today, Andrews, 17, and Hill, 19, are content. “Being transgender myself, I understand Arin better than anybody else — how good he feels and how complete he feels,” Hill added, per The Sun. She was depressed for several years before she realized she was transgender, Tulsa World previously reported. Around her 15th birthday she told her mother and asked for help becoming Katie. Andrews’ mom feels the same. for the several days allotted to the picking). his pickings to coincide with a glutted market. The whole thing was an exercise in futility. to their knees and kept their backs fairly straight. into a strap of hide cleaving to white paste. the bushes’ burdens without even looking down? you looking she smiled but not invitingly. The black folk smelt of wood smoke and leaf mould. on sale even then but none of us thought to use them. would go to wash and eat and sleep at the farmhouse. as the brew it smokily and sweetly boiled. in hands still acrid with the bushes’ juices. to leave the barn a while went to excrete. sleep to all and Alchera’s dreams to some. Bruce Beaver was born in the Sydney seaside suburb of Manly on 14 February 1928. 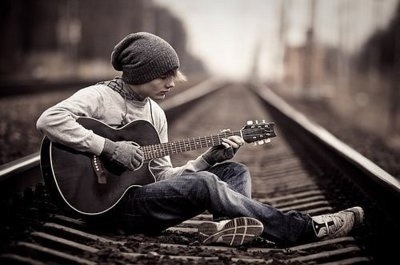 His childhood and adolescence were unhappy. He wrote his first poem at 17 – a response to the bombing of Hiroshima – and at the same age he began to suffer from what became a life-long problem, manic-depressive illness. He worked in various occupations, travelled in New South Wales and New Zealand, married, and returned to Manly to live and write for most of his life. His first book, Under the Bridge, was published in 1961, and his fourth, a breakthrough volume, Letters to Live Poets, in 1969. In all, he published more than a dozen volumes of poems and ten novels, as well as the autobiographical As It Was (1979). Risng to prominence in the 1960s, Beaver’s work had a considerable influence on the development on the ‘Generation of 1968’ and the ‘New Australian Poetry’ of the 1970s. Over the course of his career, he won several major Australian literary awards, including the Grace Leven Poetry Prize (1970, for Letters to Live Poets), the C. J. Dennis Prize (1995, for Anima and Other Poems), the Fellowship of Australian Writers Christopher Brennan Award (1982), and the Patrick White Award (1982). In 1991, he was made a Member of the Order of Australia, for service to literature. He died on 17 February 2004. I decided to use this poem today because I spent yesterday afternoon helping my neighbor pick peas. We picked what we could before the rain started. My share was the equivalent to two messes of peas. 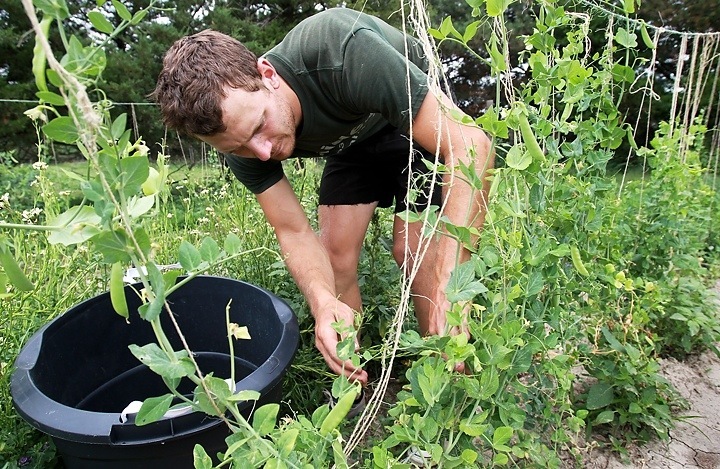 If your unfamiliar with what a “mess of peas” is, it’s the amount of peas needed for a meal. Also, these were pink-eye purple hull peas; probably the most delicious peas ever. I can’t wait to cook them along with some pork chops, and fried cornbread. Served with some sliced cucumbers, tomatoes, and onions. I might even fry some green tomatoes. It will be delicious. Cream cheese, cucumber juice and a touch of onion may sound like an unlikely combination for some people, but it sounds delicious to me. The dish is known as Benedictine and is a Kentucky favorite. It’s a recipe that I have never tried, but is one I’d like to try. I came across this recipe in my weekly email from NPR about their most emailed stories of the week. After reading it I felt compelled to share this recipe with my readers because it seems like a cool and refreshing accompaniment to any summer party. From the article, it appears that Benedictine is not well known outside of Louisville, Kentucky. I’d never heard of it before reading this article, had you? But this creamy, cool cucumber spread has persisted in Kentucky ever since Jennie Benedict, a famous Louisville caterer, invented it around the turn of the 20th century. Benedict opened a tearoom on downtown Louisville’s South Fourth Street in 1911. Back then, that was the city’s bustling commercial center, packed with stores, cafes, theaters and hotels. Today, it’s a few boutiques and several wig shops. Susan Reigler, a former restaurant critic for Louisville’s newspaper, The Courier-Journal, wrote the introduction to the re-release of Benedict’s Blue Ribbon Cook Book in 2008. Reigler says Benedict’s role in the city’s culinary history was huge and that the roots of many of the city’s flavors can be traced back to her recipes. Of course, some of Benedict’s concoctions have fallen out of favor — like calf brains and peptonized oysters for the sick. But Reigler says Benedictine has endured. One source of contention among Louisville chefs is whether to include the two drops of green food coloring that Benedict used in her recipe. The dye lets people know that it’s not just a plain cream cheese spread, but the practice is no longer popular with chefs like Kathy Cary, who prefer more natural ingredients. Cary has owned Lilly’s, a restaurant that specializes in Kentucky cuisine, for the past 25 years. For her, the dish is truly a way to showcase both local cucumbers and local traditions. Some cooks serve Benedictine as a dip, others as tea sandwiches with the crusts cut off. But Cary usually puts hers into a hearty sandwich with homemade mayonnaise, bacon, bibb lettuce and sprouts. To get the cucumber juice, peel and grate a cucumber, then wrap in a clean dish towel and squeeze juice into a dish. Discard pulp. Do the same for the onion. Mix all ingredients with a fork until well-blended (using a blender will make the spread too runny). 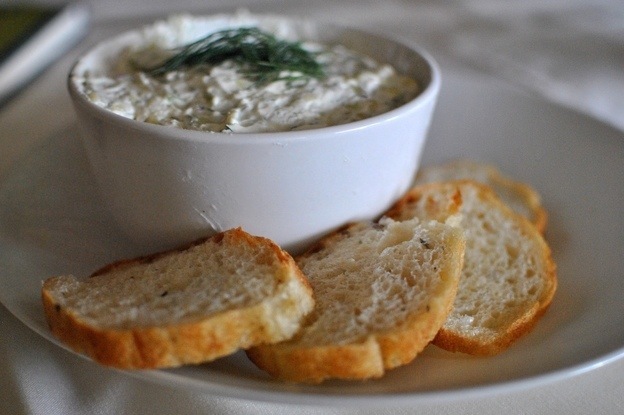 Serve as a dip or as a sandwich filling. With plenty of cucumbers and onions around, you can be sure that I will be. Making this dip. Most likely, I will do a slightly modified version of the second recipe since I like the idea of the chopped cucumber in the dip. Do you think you will try it? Or have you already had Benedictine?